When I eat a chocolate after learning, there's a chance that I'll connect the learning with the pleasurable experience of eating chocolate, which can eventually make me love learning. Does this mechanism work even when I eat the chocolate before the learning? Is the brain connecting of cause and effect time-dependent? Operant conditioning through positive reinforcement is always established by applying a stimulus after the behavior. Negative reinforcers can, however, be deployed before the wanted behavior is initiated. The reward system can be seen as positive reinforcement. In experimental paradigms (and everyday life in general), reinforcement is established by a certain stimulus presented after a certain behavior, termed operant conditioning. 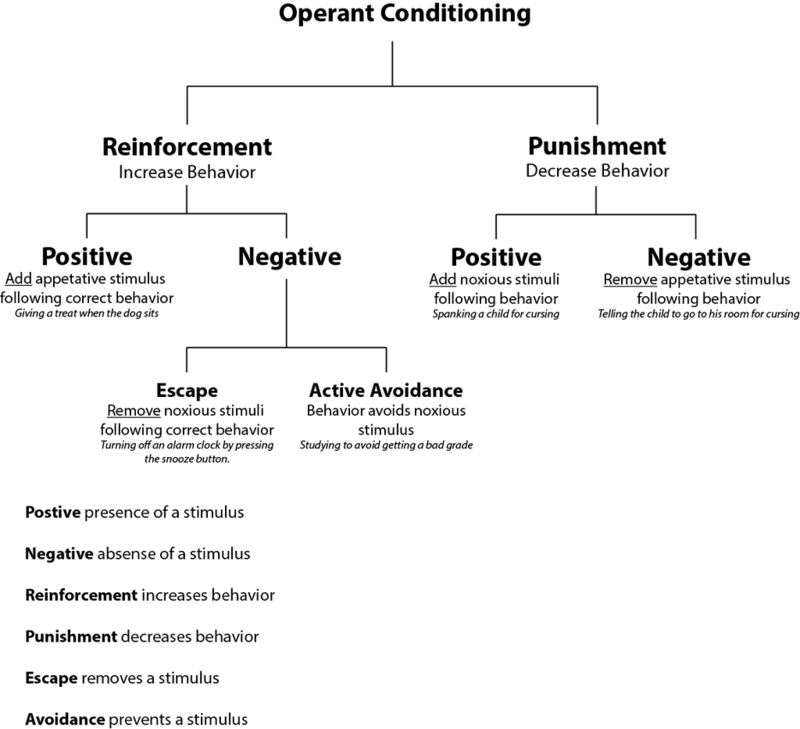 There are various forms of operant conditioning (Fig. 1). Without exception, the stimulus always follows the behavior. Your example of the chocolate is an example of positive reinforcement: If you want your dog to sit on command, you may give him a treat every time he sits for you. The dog will eventually come to understand that sitting when told to will result in a treat. This treat is reinforcing because he likes it and will result in him sitting when instructed to do so. Now, if we reverse the traditional operant conditioning process from behavior-reward to reward-behavior, then any behavior would lead to a reward because the reward has already been given. So also no behavior at all or, even worse, adverse behavior (the dog starts ripping apart the trainer) would be reinforced in this way. By definition, reinforcement is always given after the behavior, otherwise there can be no link established between stimulus and associated behavior. Note, however, that negative reinforcement can be established with the stimulus starting before the wanted behavior has been shown. The familiar example here is the nagging parent that the kid should finally clean up its room. When done, the nagging finally stops. So a negative reinforcer can be started before the behavior. But also here, the change in the stimulus switches only after the intended behavior has been evoked. Not the answer you're looking for? Browse other questions tagged learning behavior reinforcement-learning or ask your own question. Does STDP make the Hebbian learning rule redundant? Are we trying to motivate ourselves by combinating safe stressful situations with pleasure regards?